Our Park Play will be available during scheduled events only. Please check our website for our next scheduled event. Our park is not available for walk-in open play during the week. The only way it could get any better is to add a multi-level outdoor playground, a large in ground swimming pool with a zero entry design to make it easier for all size dogs to enter and a extra large Lure/Chase course! Our 35,000 square foot outdoor expansion offering all this and more will be available soon. Now you can add on these excursions to your dogs stay for a real DOGCATION!! 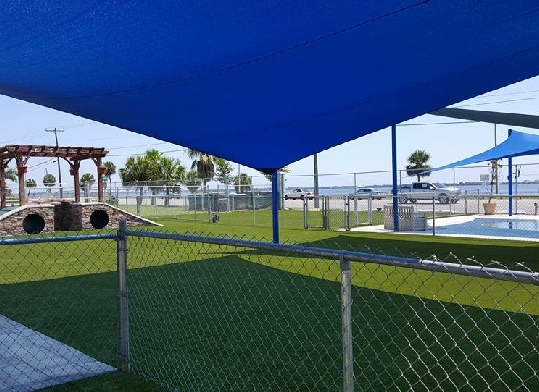 During the week our Lure/Chase course and Pool will be available for our daycare and boarding clients and on the weekends K9 Kampus will be offering Lure/Chase Events and Pool Parties. All participants will need to be registered in our system and provide proof of vaccinations to participate in our weekend events. Registration for our weekend events will be online so Remember to join our Lure & Pool Party Email lists to receive invitations to all our events! Click here to enter your information! At K9 Kampus we treat your dog like family; they will get lots of love, attention and playtime from our Pet Pals, plus all day play with other dogs at no additional cost. We are a full service facility that provides professional grooming, daycare, play dates and training classes in: Basic Obedience, Advanced Obedience, Conformation, Basic Agility, Intermediate Agility, Advanced Agility, Rally, Puppy Kindergarten, Flyball, Tracking, Tricks and coming soon Soccer and Scent Training. K9 Kampus is the only facility in the area that offers Tracking Classes with Police Officers as your trainers and we have more class types being added all the time. Plus we have a huge indoor facility so you don’t have to worry about the Florida heat, humidity, dirt or bugs, even our agility classes are indoors so you don’t have to worry about rain either! If your dog is a valued member of your family then K9 Kampus is the only place for your dog to stay when you’re away. Whether it’s for the day, a night , 2 weeks or longer K9 Kampus is your dogs’ home away from home. To see our Park Rules click here. 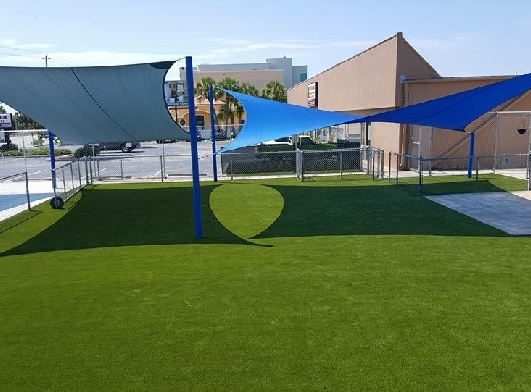 Florida’s Only Indoor Off-Leash Dog Park! Our indoor and outdoor parks will be available for you to come with your dog and enjoy on the weekends once our expansion is complete. Please see our website and Facebook page (knine kampus or K9Kampus) for details when that will begin. * Daycare ends at 5pm but we realize many parents are just getting out of work at 5pm so we give you a grace period until 5:45pm to pick up your kids. Please know that promptly after 5:45 we start charging $5.00/hour/dog for pick-up until our closing hour and $20/hour/dog after closing hour. We are very strict with our schedules. ** There are no graces periods for weekend daycare pick-ups. Therefore after 4pm there is a $20/hour/dog fee. * Early Drop-Offs: K9 Kampus understands that there will be times that our clients may need to drop-off before out doors are officially open. Accommodations can be made for early drop-offs by REQUEST only. Early drop-offs must be pre-arranged and a $20/hour prior to open fee must be pre-paid. This is a non refundable fee. It is important to understand that all our attention is given to our current boarders prior to opening. When a dogs enter the facility for daycare or boarding drop-off it requires additional staff to be on-site, therefore, we require pre-arrangements and fees for early drop-offs to be pre-paid. Please note that if you arrive before our hours of operation you may not be allowed entry until we are officially open. If you are allowed entry into the facility before official hours you will be charged $20/per hour that you are early. Lure and Pool is also available to the public on Scheduled Saturdays. K9 Kampus recommends and prefers all dogs to be dropped off no later than 11am. This provides us with ample time to play and exercise your dog so they will sleep well at night. This is especially helpful for dogs that exhibit nighttime anxiety while apart from their parents. Dogs entered open play after 11am affect the already established group dynamics. Extra fees apply to dogs arriving after 11am. K9 Kampus reserves the right to refuse any dog entering the facility after 11am. This time frame has been chosen to avoid conflict with the busy daycare drop-off & pick-up times. If you need to pick-up before or after these times please coordinate this with the front desk. We also ask that you are patient with us during this time frame because it is a very busy time during the day for us.